Where oh where is the snow? Winter is mildly bearable when a sparkling blanket is present on the twisted skeleton trees. Right now, New York is experiencing the teeth-chattering type of cold you feel deep in your bones. So, because I have nothing better to do (a lie--I'm procrastinating), I deemed it fitting to pull together a few cozy provisions currently helping me muster the energy to do anything other than burrow deep under the duvet. ONE: Sunny-colored flowers. Daffodils are just beginning to pop up in the markets (yay!). TWO: Cute pompom hats. Makes braving the windchill not quite as terrible. THREE: Spritzing on a yummy, summery fragrance to trick myself into thinking that season is near. FOUR: Cozy pajama pants. I'm inclined towards this striped pair. 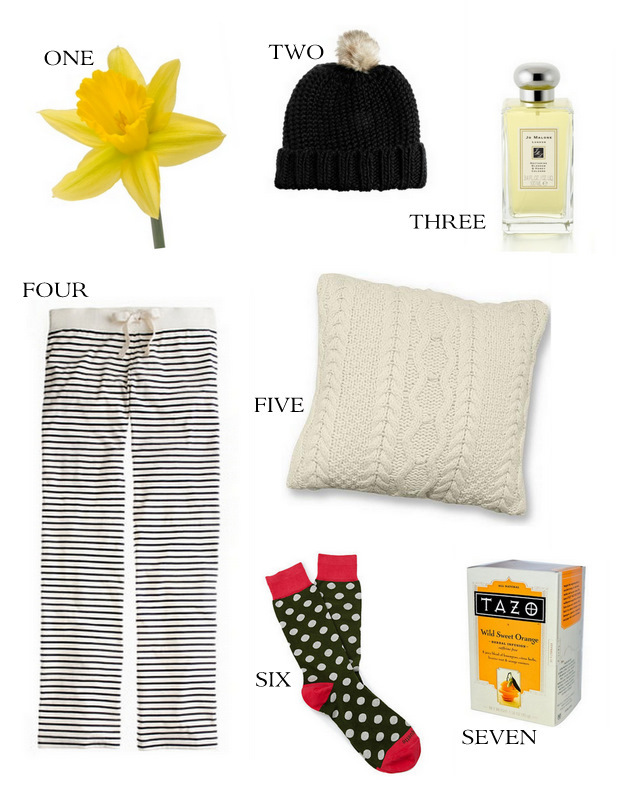 FIVE: An oversized cable knit throw pillow. I bought mine years ago at Pottery Barn and adore it. SIX: Socks in a fun, happy pattern. Because nothing is worse then cold toes. SEVEN: Something hot in my mug at all times. I love a bit of citrus & spice. Is it freezing where you are? What are some items in your "stay warm" arsenal? I had my hometown's weather pulled up instead of SF's this morning, and I thought I would keel over when I saw how cold it was! I love thin long johns under my jeans and sweater–and never-ending cups of cocoa! Cozy + cute...bring on the snow! other side of the world here, so definitely not freezing! I wear a really thin Patagonia vest under my coat. Makes all the difference! Stay warm, my friend. I love everything you have picked out!